Virginia McKevitt is a LibraryThing Author, an author who lists their personal library on LibraryThing. 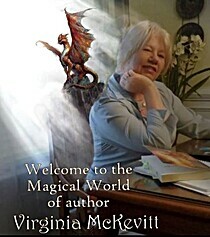 See Virginia McKevitt's author page. About meVirginia McKevitt was born in Long Beach, California, but lived most of her life in the suburbs of New Orleans, Louisiana, the city she will always call home no matter where she lives. She has been many things in life; a wife, a mother, a salesperson, owned a successful landscaping business and raised horses, but her love of writing was her true calling. Hurricane Katrina, a curse to many, changed her life. The business gone and family scattered, she moved to Alabama, then to the mountains of Georgia. Life urged her on, so when she found the first chapters of a manuscript she had started while still in New Orleans, she sat down at the computer and never looked back. Her vivid imagination and love for fantasy has culminated into a stories she hopes will captivate anyone who loves a good journey. Fracture The Secret Enemy Saga, started so many years ago was the beginning of the road. The Hunted and Secrets is the continuing journey, with Destiny to be released in 2017. Her new series of novels, Wendy Woo and the Dragon Eggs~The Gatekeeper Chronicles, is based on a young girl who, with the help of three new friends, finds herself in a mystery full of surprises and humor. Oh, and did I mention; an evil Queen, a wizard, dragon eggs, and a bit of magic? Where does the journey go from here? Follow this crazy path and see where the road will lead. About my libraryI will read anything that holds my interest but fantasy is my love. My library is a mashup of mysteries, thrillers, science fiction, and fantasy, with a few horror greats thrown in for balance. I read indy and traditionally published authors alike. Being an indy author myself I find there are some excellent reads in my world so go out and read what you love but take a chance on someone or something new. Open up your worlds.